Even before soaring to the apparently impossible challenge of an outright majority at Holyrood in 2011, the Scottish National Party had long dominated the political narrative in Scotland. With the independence referendum in 2014 and their near clean sweep in the general election the following year, the full force of the SNP’s power was felt throughout the UK. Now, with the party’s rivals still trailing limply in their wake, this new account by two established SNP-watchers explains just how they have stormed to victory, changing the face of Scottish – and British – politics for ever. Tracing the path from grassroots party of protest to professional, highly centralised electoral machine, Rob Johns and James Mitchell explore the differing leadership styles and often radical shifts in the party’s image, from ‘tartan Tories’ to self-styled anti-austerity crusaders. Along the way, they analyse the internal battles between the leadership, members and activists; map the changing profile of the average SNP voter; and outline the new challenges that have come with increased electoral success. 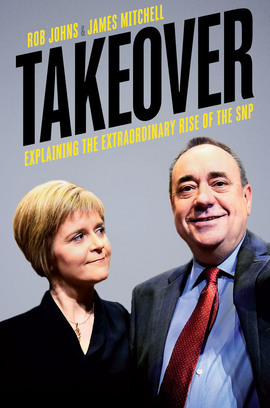 Engaging, impartial and above all insightful, Takeover charts the rise and rise of Scotland’s biggest party and asks: where now for the SNP in the wake of a historic third successive victory?